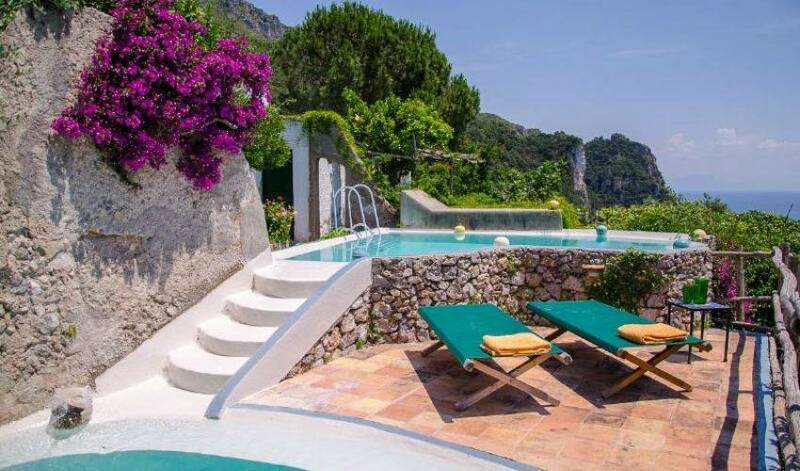 Villa 9121 is a medieval watchtower situated within one of the most extensive private estates of the Amalfi coast with 3 different and charming separate annexes. 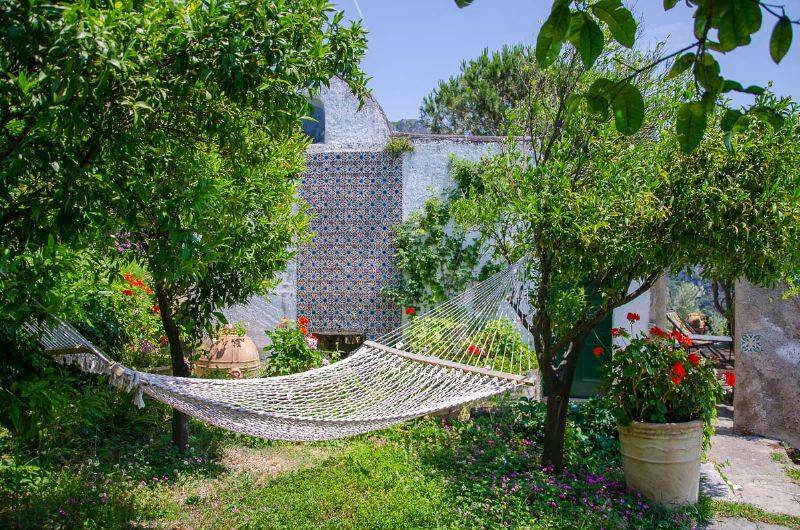 The grounds of this property descend from the coastal road down through a landscape of dense Mediterranean vegetation and scented pine woods, lemon trellises and beautifully-tended gardens as far as the sheer sea cliff upon which the ancient tower stands. The recently renovated tower is elegantly furnished with antiques and modernist design classics which accentuate the beauty of this unique building. Plate-glass windows offer a spectacular view. 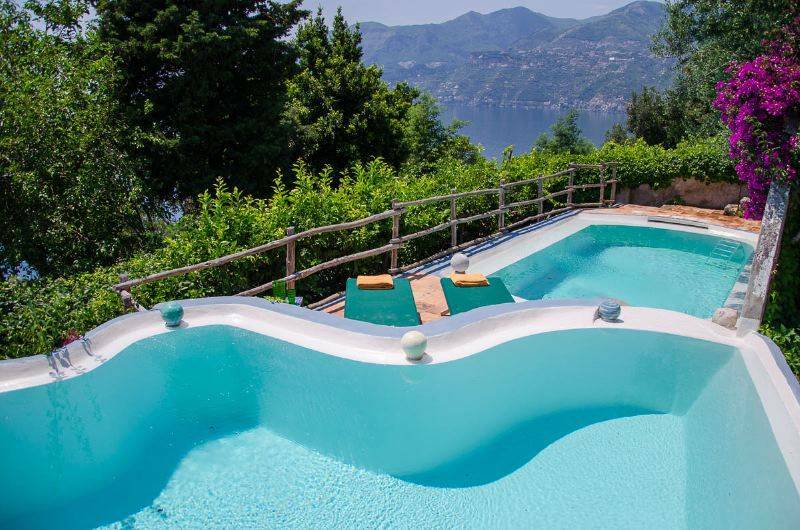 There is a series of panoramic terraces looking straight across to the sea and the unspoiled Amalfi coastline. These terraces provide the perfect setting for relaxing and eating outside. 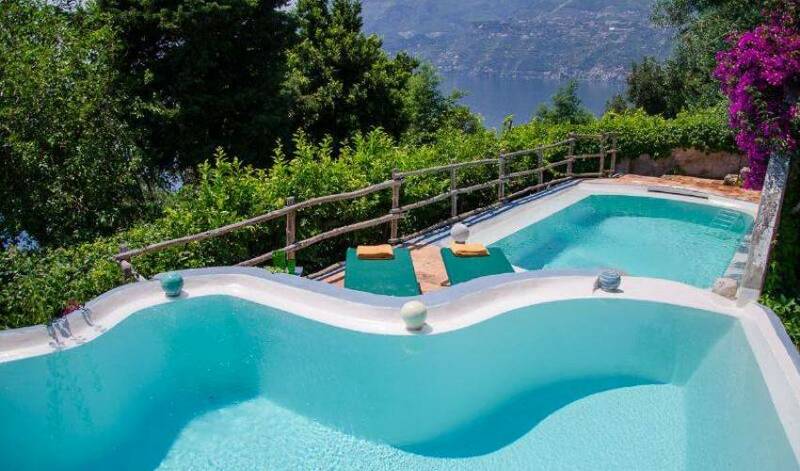 The property also boasts an exclusive double-level swimming pool, ingeniously linked by communicating steps. 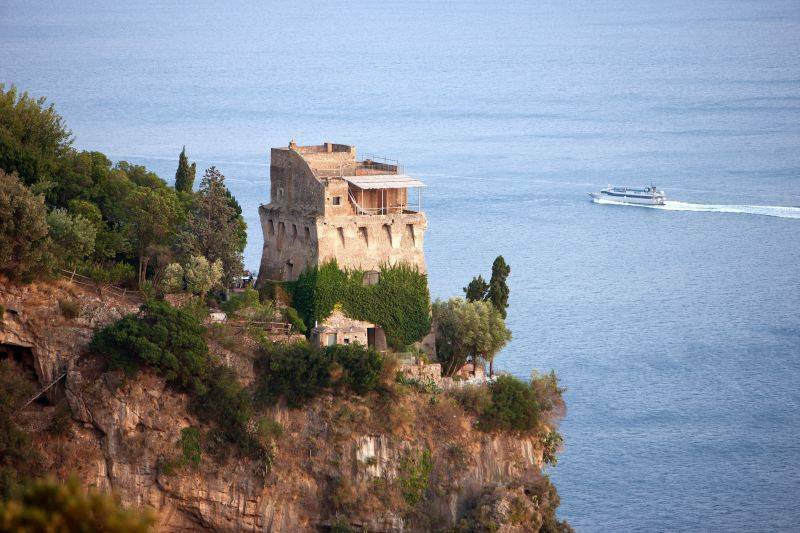 A winding path leads down below the tower to a private cove for swimming in the sea. This enchanting property comprises 3 independent annexes discreetly positioned throughout the grounds. The estate provides guests with small electric cars for easier access to the property which is situated at the end of a winding tarmac road. The property, with its own private chapel in the grounds, offers the perfect setting for an exclusive and romantic wedding celebration. Within the large estate is another independent property. 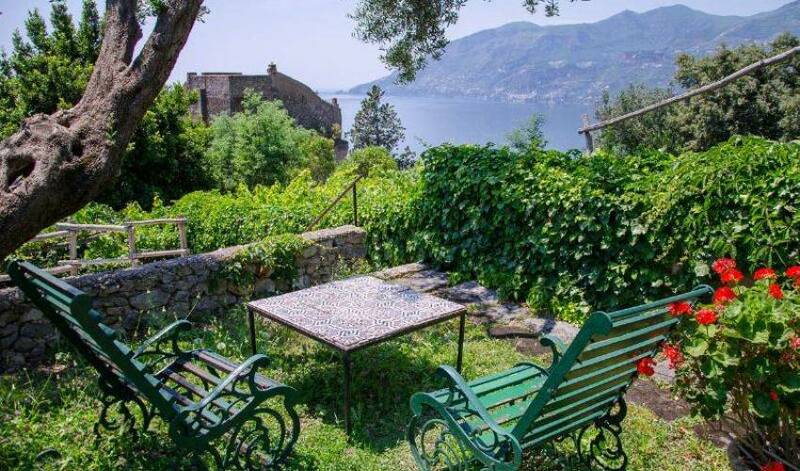 It is possible to rent the entire estate accommodating up to 24 people. Professional Cook (1 day off) for the preparation of lunch and supper. Concierge service at the reception, able to satisfy all your needs. Gym with two treadmills and a stationary bike. Meeting room equipped with a table for 20 people, with screen, projector and wi-fi (shared with the other villa). Maiori, with all essential services, is 3 km. away. Our Kitchen: all guests will enjoy our Chef’s cuisine: with courtesy and confidence, he can satisfy even the most discerning guests. 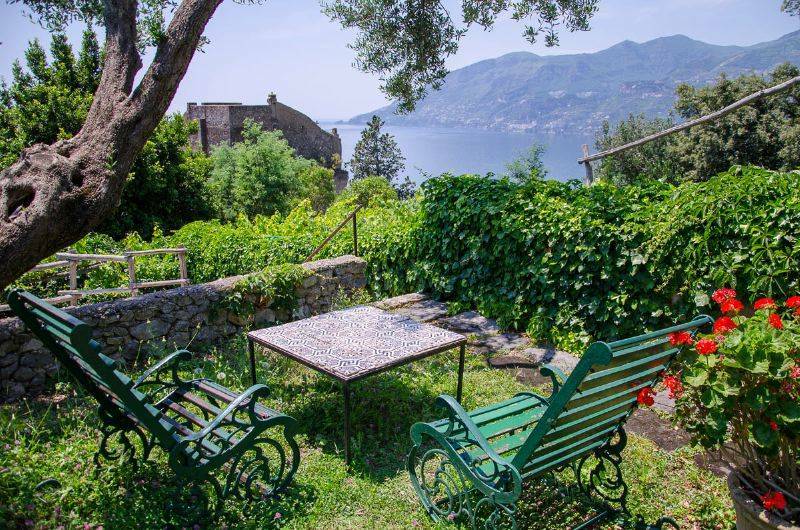 He proposes a local fish-based cuisine, but also wonderful grilled meats, pasta, a wide variety of fresh vegetables and fruit and desserts to die for! and fresh fish in every way (fried or oven-baked). A triumph of cheese and mozzarella with cold cuts and tasty roasted vegetables. Savory condiments and only seasonal raw materials. A kitchen that takes away the desire to go eating elsewhere! Our selected staff offers the due professionalism in services, ensuring the warm personal touch that you can find in a private house. 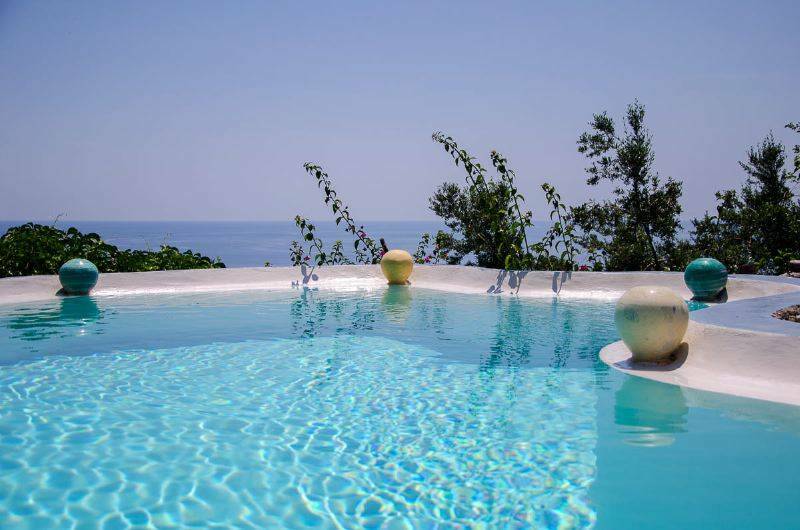 In addition to the Concierge service that guarantees assistance for any Guests’ needs, each house has its own Chef, a Butler and a cleaning lady, in order to offer the best services. 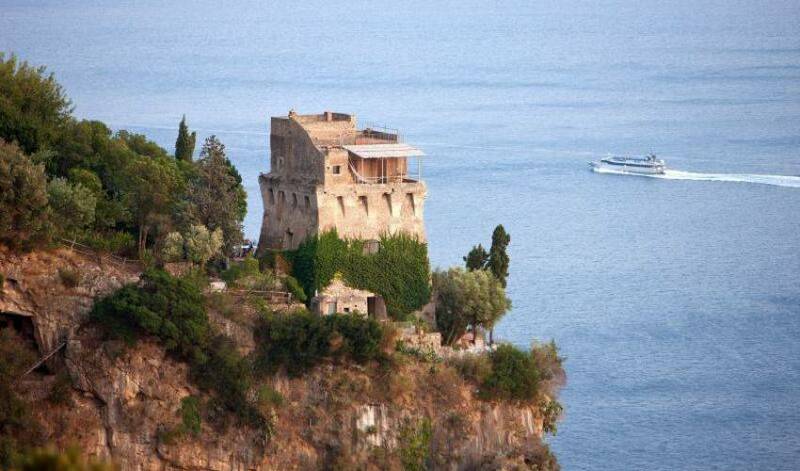 The staff is local and knows all the customs, habits and histories of the Amalfi Coast. They has been working with us for many years in a harmonious team, they are all collaborative and they always try to best satisfy with kindness all the needs of our guests. Ground Floor: large entrance/living-room with access to the terraces through plate glass doors, leading down to separate dining-room with magnificent view. Fully-equipped kitchen with larder. Second Floor: (with access from external staircase): 1 double master bedroom with air conditioning and 1 bathroom with shower. 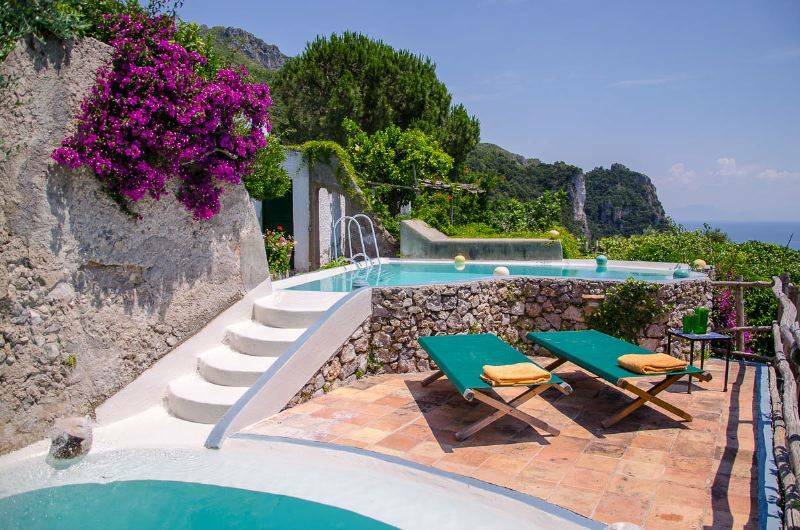 Access to a private terrace with special solarium, outdoor shower, and splendid views of the sea and the Amalfi coast. 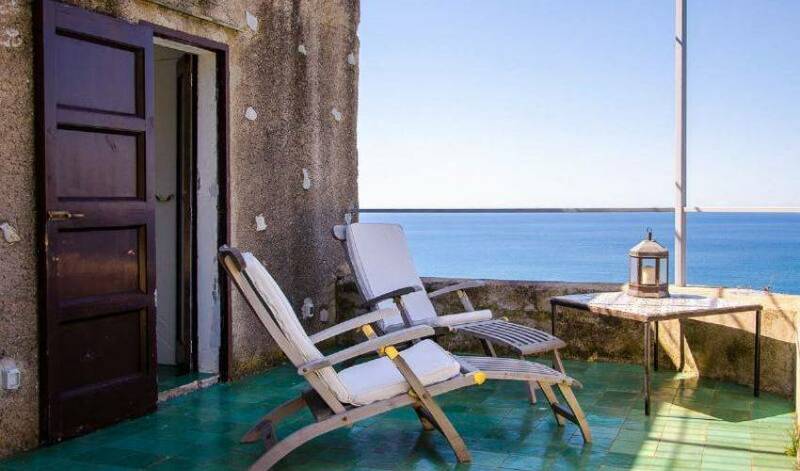 Situated next to the Torre with 1 double bedroom and 1 bathroom with a glassed-in shower with views straight out to sea. Air conditioning and fridge. 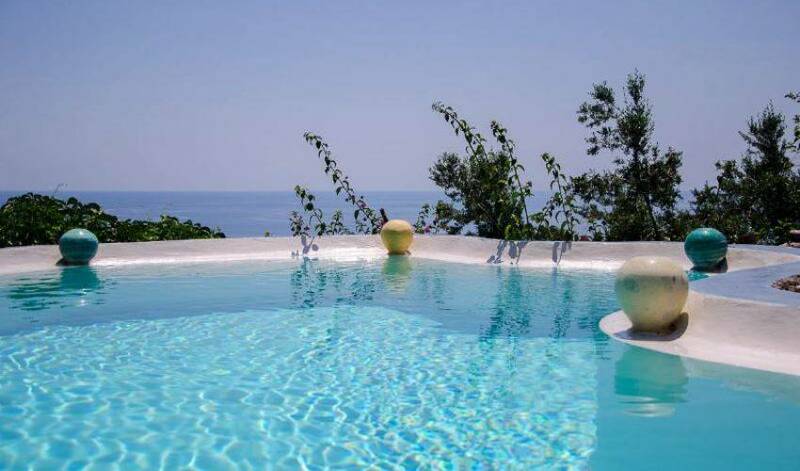 Situated near to the swimming pool area with 1 double bedroom and 1 bathroom with shower, a large living room giving onto a charming terrace. Air conditioning and fridge. 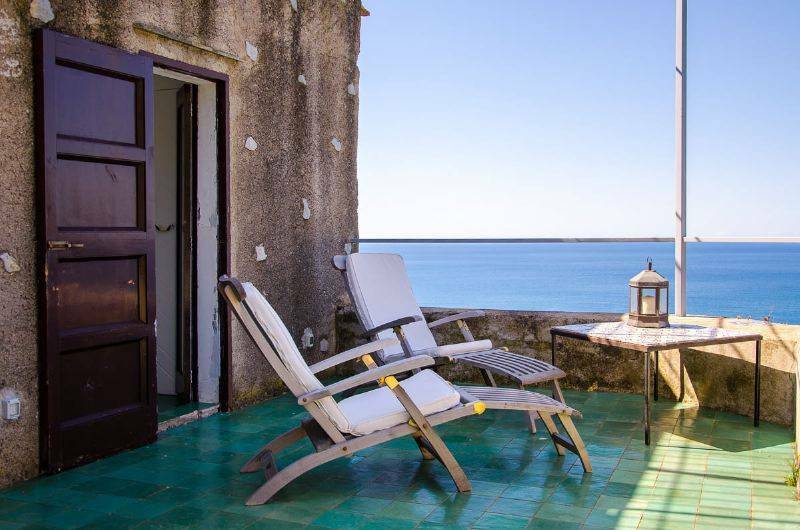 Very intimate setting with 1 double bedroom, 1 twin bedroom, 1 bathroom with shower and a wonderful terrace perched high above the sea. Air conditioning and fridge. Concierge service at the reception, able to satisfy all your need. 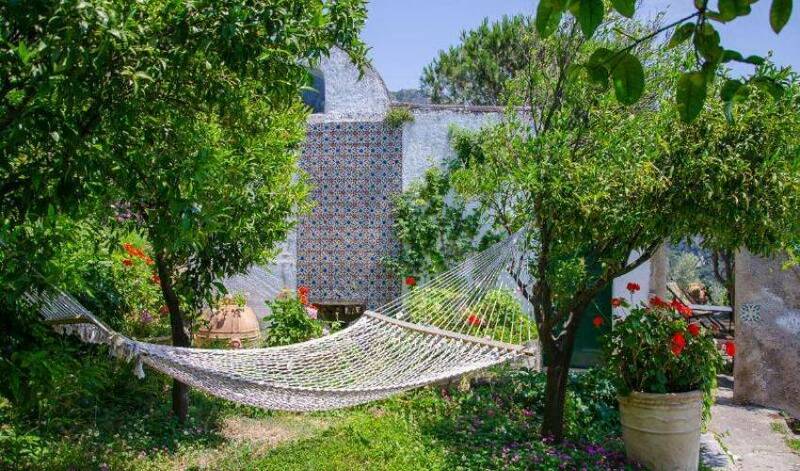 Additional change of bed and bathroom linen: 10 Euro per person. Laundry service at a unit price per garment. Overtime rates for cleaning service: 20 Euro per hour. Overtime rates for Cook and Butler: 60 Euro per hour. All costs for the supply of groceries will be charged at the end of the stay. The deposit is deducted from your credit card for the entire period of stay.